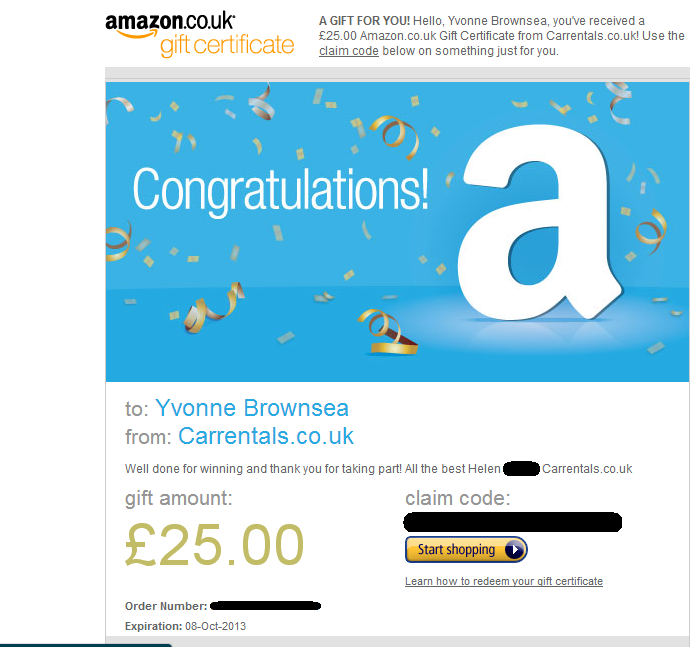 I won a £25 Amazon voucher from Car Rentals UK on Facebook on 8th October 2012. 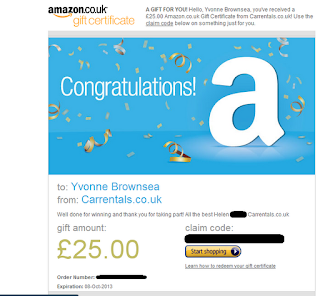 I received the voucher by e-mail same day! I was initially going to buy a couple of seasons of my favourite TV programme of all time (for those not paying attention, it is 'The X-Files') on DVD, but as Halloween is impending and were having our first Halloween party (for the kids early evening and for the adults at night), then I am most likely going to use it for a Hallowe'en (that's how it's really spelt you know!) costume. Now, just to decide between a Witch, Dead Riding Hood or a Vampiress - what do you think? Hubby is going to be a vampire and son can't decide on a vampire or an alien!